(3) resources: tools, data, and services. Dr. Rajan added, "My prior experiences on building cyberinfrastructures that are aimed at democratizing access to data-driven sciences (both for research as well as for education), and on designing broadly accessible curricular activity such as the Midwest Big Data Summer School (attended by close to 150 participants from over 28 universities and industry partners) will inform my contributions. I look forward to working on these goals." Rajan will participate in his first committee meeting on October 12th. His term will run for two years. Hridesh Rajan has a professor of computer science at Iowa State University since 2005. 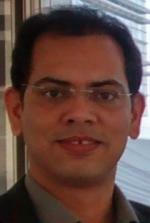 Hridesh earned his MS and Ph.D. from the University of Virginia in 2004 and 2005 respectively. Hridesh's recent research and educational activities are aimed at decreasing the barrier to entry to data-driven sciences to broaden participation. His work on the Boa project (http://boa.cs.iastate.edu) is aimed at invention and refinement of cyberinfrastructures that democratize data-driven science. His work on the Midwest Big Data Summer School (http://mbds.cs.iastate.edu) is experimenting with broadly accessible data science curricula. Professor Rajan’s research interests also include programming language design and implementation, and software engineering. Hridesh received the National Science Foundation CAREER Award in 2009, LAS Award for Early Achievement in Research in 2010, and a Big-12 Fellowship in 2012. He is a senior member of ACM, and a member of IEEE, and AAAS.